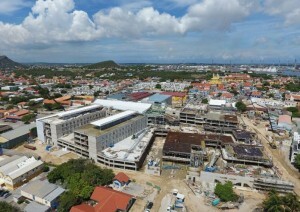 WILLEMSTAD - The new hospital Hospital Nobo Otrabanda should be ready by mid-2018. The intention is to start using the hospital by the end of next year. The construction of the hospital is still on schedule. The parliament of the Netherlands, Aruba, St. Maarten and Curaçao visited the construction site last Wednesday. They were told the news of the completion during the tour. Minister of Public Health, Zita Jesus-Leito also attended the tour.